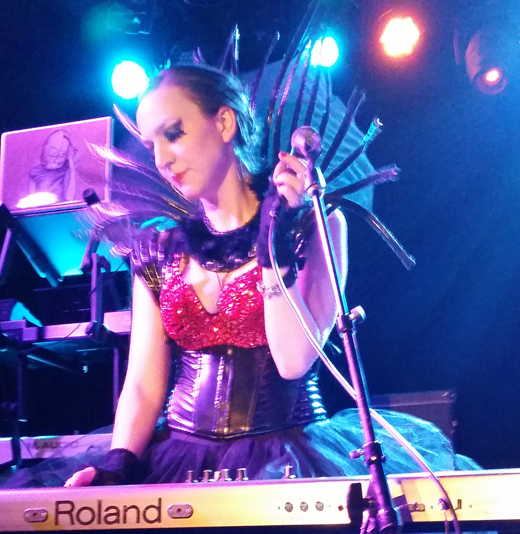 Inspired by the gritty extremes of her new digs in New York, singer/actress Kai Irina Hahn brought her EBM band to the Knitting Factory for its debut performance. First up band Thorazine Unicorn, a very attractive and talented group consists of a vocalist, guitar, bass and drums, but sounds like a lot more, with an industrial Sci-Fi sound, that comes across better on its studio-produced CD than the Knitting Factory’s speaker system. But they looked so good, I think I prefer the live performance. Opening for Sedona was a very respectable classic-rock-meets-Goth group calling itself The Flies Are Out for Blood, that re-animated the spirit of the Doors with dark, poetic vocals, accompanied by crunching riffs and acid-laced melodies. I would compare them with Gene Loves Jezebel, but without implying anything imitative or lacking in originality. After another, this time, bass-driven song, Kai broke for a modest costume change. Wait. Did I say “modest?” Dressed in a red bikini top, corset, tutu and knee-high, multi-buckle, patent leather, giant platform, high-heel, boots, Kai’s costume change consisted of replacing Loki the snake, snuggled like a shawl around Kai’s neck and shoulders, for a tall, fan-like (or perhaps batwing-like) collar rising up behind her neck. She now manned the keyboard —set on strings — and sang another new song, full-throated, “Between Now and Tomorrow” ending violently, high-pitched and seemingly out of control. The set ended with the notorious Billie Holiday standard “Gloomy Sunday,” performed in anything but standard style. Slowed to a crawl, and with ultra deep droning and deranged-piano arpeggios, Kai growled out the suicidal lyrics in the dramatic style reminiscent of Marlene Dietrich. The crowd screamed for more and forced an encore to be repeated from the preceding set and off their EP, “Cross the Line,” before lining up to buy a copy. Recently transplanted from London where she honed her vocal skills on German art songs, classically trained lyric soprano Kai has pulled together a small group of musicians to found an Electro Dark Wave band with a very appealing, hybrid sound. 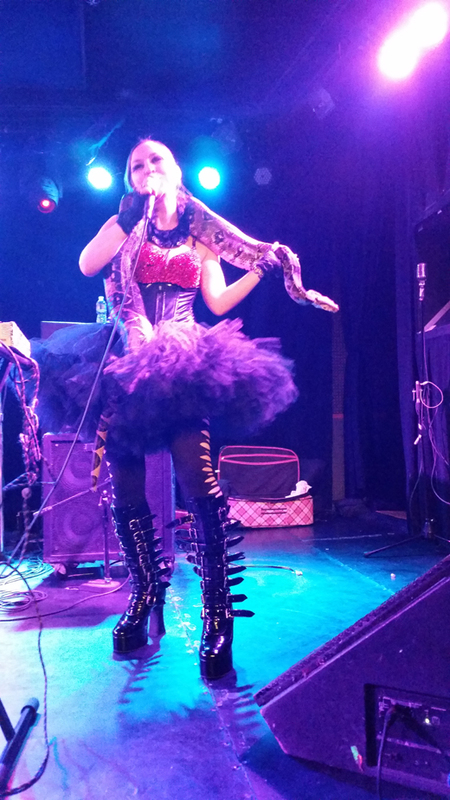 The Sedona Effect —every bit a performance art project as it is an EBM band —made a spectacular debut, which should contribute to their rapidly growing fame in the metropolitan area, and allow multitalented, front Kai to establish herself as a kind of Nina Hagen meets Billie Holiday.